Lorenzo Gomez, III used his intelligence, drive, creativity and courage to go from the stockroom to the boardroom of two successful organizations in San Antonio; Geekdom and The 80/20 Foundation. 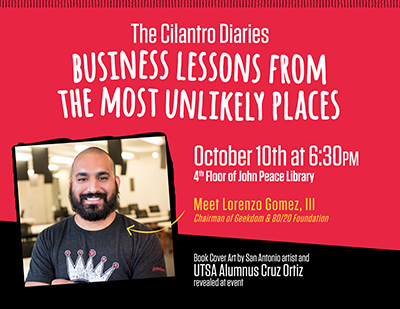 Hear the stories that inspired the book The Cilantro Diaries at this event sponsored by the UTSA Alumni Association. Well known San Antonio artist and alumnus Cruz Ortiz created the art for the book cover which will be revealed at the event. RSVP below as space will be limited.